Now that we covered how we got our discount tickets to Universal Studios here’s the lowdown on how the hotel situation works. My default hotel stay is redeeming points. However, there’s something unique about the hotel situation with Universal Studios in Orlando. The onsite hotels include early park admission to the Wizarding World of Harry Potter. In addition, the three top tier hotels (Portofino Bay, Hard Rock Hotel and the Royal Pacific) include free universal express passes. The value of the express passes during a busy time is much greater than the cost of an on-site room. 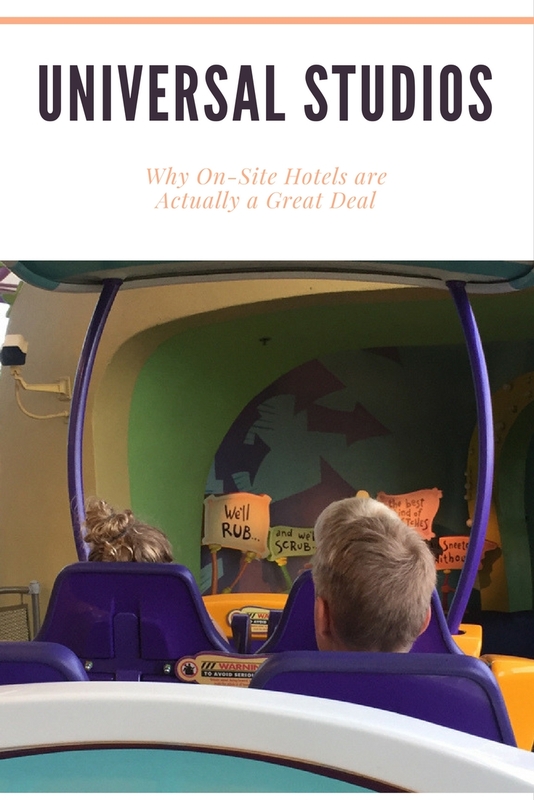 Once I understood the sweet spot of using an on-site hotel for the express passes and stacking it with an annual pass rate (obtained very inexpensively), the savings more than made up for the value I would get from our hotel points off-site! At Universal Studios an express pass can be used an unlimited number of times (a few of the rides are excluded). You also don’t need to schedule the times to use the express pass. They’re very convenient, but they are expensive and they don’t come with your ticket. We’re a family of five. The passes start at $89.99 per day for both parks and go up. However, once you multiply the pass price x number of people x number of days…. Last summer we were looking at $500 per day for express passes for our family. That wasn’t going to happen! Since the Portofino Bay, Hard Rock Hotel and the Royal Pacific hotels include free universal express passes it was time to look at the hotel pricing. The cost for a room for a family of five was cheaper than buying the express passes! Once I saw the value of an on-site hotel, which includes the express passes for everyone staying in the room, it was time to find the best possible price! Seasonal Rates. The prices of the rooms fluctuate by season. Universal doesn’t publish the rate calendar anymore, however, if you look at the one for last year on Orlando Informer, you’ll see the typical seasonal dates. Use an Annual Passholder Rate. As we discussed in obtaining Universal tickets, the price to upgrade to an annual passes can be as low as $20. Using the annual passholder rate for just one night usually more than covers the upgrade cost. We saved more than 10x the upgrade cost! As an example, last year when we went in mid-late August, the rate was $254 per night; the annual passholder rate was $169 per night. We saved $85 per night (plus tax)! Number of Nights. If you are booking a room for the express passes, you’ll get passes for the days including check-in and check-out. You can check-in bright and early in the morning. If your room isn’t ready, you just check your bags and go to the kiosk in the lobby and self print your express passes. Book Annual Passholder Rate Before you go. You don’t need to have an annual pass to book an annual pass rate. You just need to show the annual pass during the hotel stay. We checked into our room, then went to Universal to upgrade to the annual pass. To book the annual passholder rate, use the code: APH. Book in Advance and Adjust Downward. You can book your rooms before the APH rates are released. When the passholder rates are released (usually a few months out), you can adjust your rates if the APH rate is available on your dates. I keep an eye on this thread at DisBoards to watch for the release of APH rates. In addition to getting the annual passholder rate, we also stacked the hotel stay with a free night! Citi Prestige 4th night free. We booked our hotel stay on our Citi Prestige card to get our 4th night free. The price for our room for four nights at the APH rate would be $760; we received a credit for the 4th night back at $190. Total paid $570. That means that we were paying the equivalent of $142 per night ($570/4), and this included express passes for a family of five for five days! Redeem Chase Ultimate Rewards for your stay. Use Amex Fine Hotels and Resorts to stay at Portofino Bay. Parking is Extra. We didn’t need a car during our stay. A free water taxi takes you from the hotel to both theme parks and the restaurants. Renovated Room. The first room we ended up in at the Royal Pacific was not in very good shape. A quick call to the front desk and we were relocated to a renovated room. Specifically, I noticed the first room had a dingy bathtub. The renovated room had a shower. I’m not sure if it’s any indicator of a newly renovated room, but I would request a shower on our next stay! Hotel & Pool Hopping. We stayed at the Royal Pacific, but with your room key, you can hop to the other Universal hotels, and specifically the pools. We went to the Hard Rock pool and had a great time. When we return this summer, I’d like to visit the lazy river at Cabana Bay! Loews Hotel Chain. The Universal Hotels are owned by Loews Hotels. Their rewards program isn’t as substantial as other hotel chains, but you can sign up for their rewards program anyways. Dining. I’ll cover the dining more in the future, but we did eat at Emeril’s Tchoup Chop, Jake’s American Bar and the Islands Dining Room at the Royal Pacific. We also ate at The Kitchen when we were at the Hard Rock. There is also a Wantilan luau at the Royal Pacific on Saturday nights at 5:30 pm. We’ll add more features of each hotel when we stay at them on our return visit. 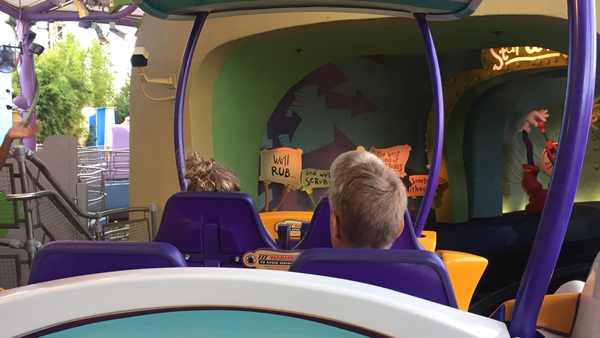 Obviously, you don’t need an express pass. Based on when you are traveling look at the crowd calendar. I would determine first if you want express passes. If you do, then I would compute the value of staying on-site. If you don’t want the express passes, then I would consider many of the points hotels in the area. As a reference point, we did stop back for a day at the end of our trip to Florida without express passes. Let’s just say it reinforced our decision to stay on-site for express passes for any future return visits! Do you plan to stay on-site or off-site for your trip to Universal Studios?